The loss of life from motor vehicle crashes is devastating because it claims the life of young people and shatters entire families and communities. 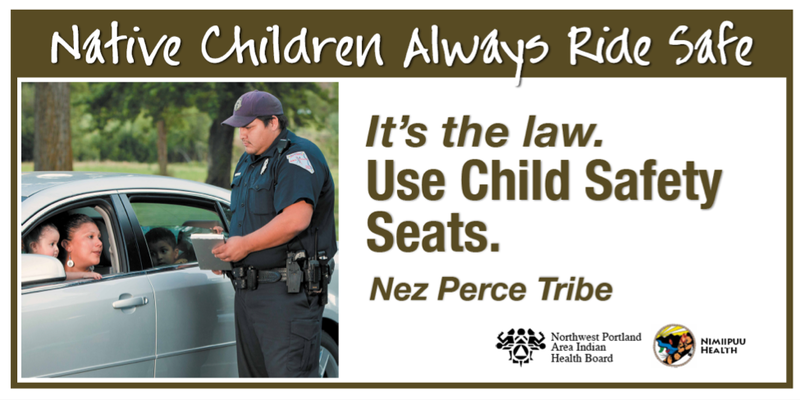 In the state of Idaho, which is home to the Nez Perce Tribe, an unbelted passenger is killed every five days. Most of these deaths could have been prevented by passenger restraints. While we have many priorities, our tribe chose to address car seats, because motor vehicle injuries are highly preventable and because child safety seats work. 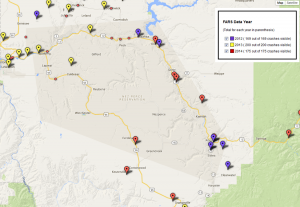 Unfortunately, fatal crashes happen on the Nez Perce Reservation. If you would like to explore fatal crash data, look at the NHTSA website. 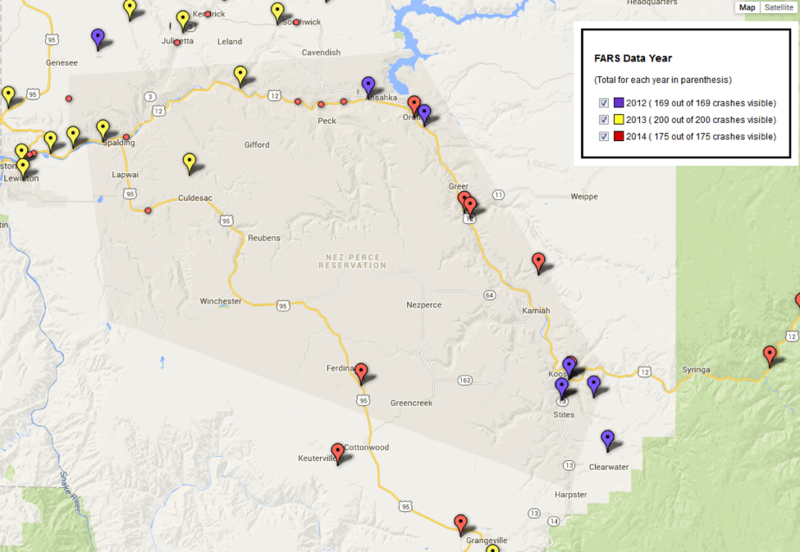 You can map all fatal crashes that had GPS coordinates reported. Of secondary importance to us was the financial burden of motor vehicle injuries and deaths, which cost, on average, $6,493,502 per occurrence. (Source: Idaho Office of Highway Safety, http://itd.idaho.gov/ohs/2014Data/Analysis2014final.pdf) The community picks up 75% of motor vehicle crash costs, which are passed on through insurance premiums, direct out-of-pocket payments for goods and services, and increased costs for medical care. A large portion of our contract health service dollars are spent on motor vehicle injuries. We also did some in-depth interviews and focus groups to find out more about why children were not using car seats. We found out that convenience, or being in a hurry, were definitely a factor in people’s decisions. We also found out that not everyone buys into the idea of car seats. As one mom said, “My mom and dad don’t use the car seats when they take them.” We found that community support for children was high, and that people felt a strong connection to and responsibility for each other. One thing that facilitated car seat use in our community was when families had consistent rules about using seat belts and car seats, and when they enforced those rules by not moving the car until everyone was buckled up. Our team got together and reviewed all the data we collected. Together, we made plans, based on all the information we collected at our tribe. We thought about how to reach the kids most at risk and how to reflect the ideals and values of our tribe. At first, most of our efforts went toward a media campaign to promote child safety seat use. 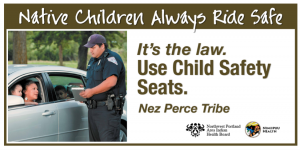 We reminded people that using child safety seats is the law on the Nez Perce reservation. We published articles in the Tac’ Tito’ gan, our tribal newspaper, and created a video PSA that aired on KLEW, the TV station out of Lewiston, Idaho. We also created posters, billboards, mass emails, and check inserts for tribal employees. Some of this media had a special focus on getting grandparents to use child safety seats, since this was an important issue for our tribe. To evaluate our efforts, we repeated the Native CARS survey to see if child safety seat use had increased. We were happy to find that it did! Proper restraint use increased from 41% to 60%! 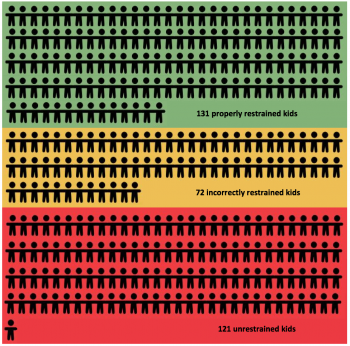 Far fewer kids were unrestrained too. From 2011 to 2013, we maintained Native CARS activities, but did not start any new activities. After this time period, we saw proper restraint decrease a bit, to 52%, but importantly, this movement seemed to be from proper restraint to incorrect restraint, rather than completely unrestrained. Our remaining risks were children graduating too early to the next seat, children traveling close to home, and 7-8 year old children. Because of the success of our work, we received funding to continue our efforts. Because incorrect restraint was an issue, we decided to amplify our child safety seat distribution program. You can read more about how we did this, including making partnerships and finding funding for seats, in Module 9. Then, we decided to take our efforts to the next level. 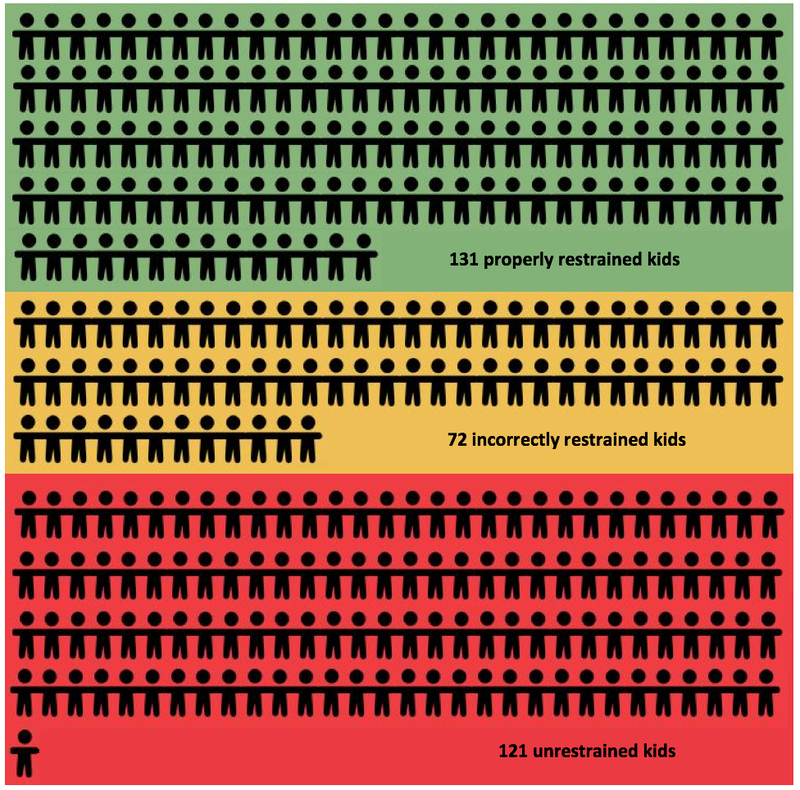 We reviewed our quantitative data, which showed that more kids were using restraints, but not necessarily the right ones. 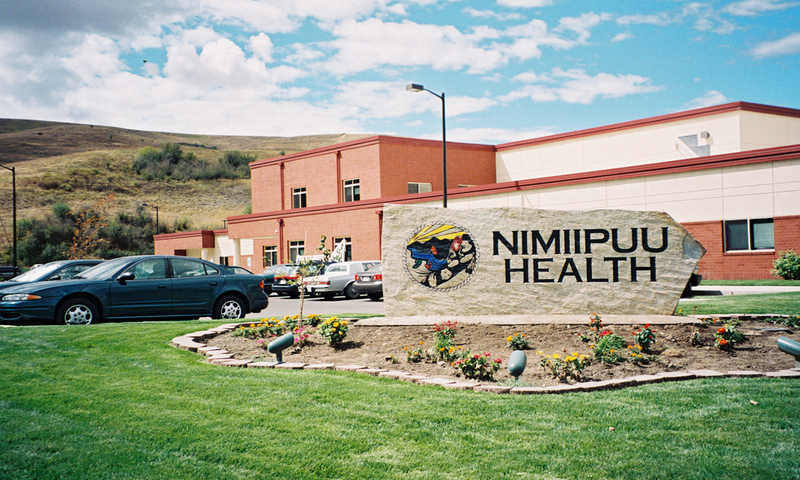 Our qualitative data said that Nimiipuu Health, our Tribal Clinic, including the MCH program, was the #1 source of child safety seat information in our community. We considered our existing resources which included CPSTs, child safety seats, and a distribution program, and thought, “How do we build on these strengths? How do we link these resources together?” In a clinic staff meeting, we discussed creating a reminder in our electronic health record system, RPMS, to remind providers at key well child visits to order a consult with the CPS tech for car seat education, seat check, or a new car set, as needed. See Module 10 for more on how we did this, and how it works. Now that we have all these other things in place, I would say the next step for our tribe is to update our tribal child passenger safety law. But, it was important for us to get all these other pieces in place before changing policy. Now that we have been talking about car seats and being consistent with getting seats to people and checking the seats, I think we’re all on the same page and agree that child passenger safety is a priority.